Motivate Korean — Want to Improve Your Korean Reading Speed? Learn to Type! Want to Improve Your Korean Reading Speed? Learn to Type! One of the coolest things about the Korean language is most certainly its writing system. The system, called 한글, is unique to Korean, and has remained one of the world's easiest-to-learn alphabets since its creation in the late 15th century. Though you can learn to identify and sound-out the 40 symbols of modern 한글 in just a few hours, actually becoming comfortable reading written Korean at a normal speed can take quite a bit longer than that. If you're not accustomed to learning languages that don't use the Latin alphabet (like English, Spanish, German, etc. ), it's probably been a long time since you learned to read, as you did when you were a child. Doing this again for Korean can certainly be frustrating, and could potentially have a negative impact on your motivation. To help you avoid that frustration and streamline the reading process, allow me to share the strategy I used to kick-start my Korean reading speed, even from the very beginning. However, let's first outline the similarities and differences between learning to read English, and learning to read Korean. If you've succeeded in making it this far, I know for certain that you, dear reader, are capable of reading at least one writing system: the Latin script used by English. Stage 1: You learned how to identify individual symbols, and pair them with their equivalent sounds Stage 2: You learned how these symbols, when written one after another on a page, could combine to form words. Put simply, you first learned to read letters like "b", "i", "r" and "d", and then later learned to read them as a unit ("bird"). Nowadays, when you see "bird", you don't read the letters in a row ("b-i-r-d"). Instead, you read the whole word as its own visual "shape". To learn to read Korean, you have to follow a similar process. Korean's process, however, has three steps, compared to English's two. Stage 1: Learn to identify individual symbols, and pair them with their equivalent sounds Stage 2: Learn how these symbols, when written together in a square-like formation, can form a "syllable block" Stage 3: Learn how these syllable blocks, when written together one after another on a page, can combine to form words. So, in stage one, you start by learning the symbols "ㅇ", "ㅗ", "ㄹ" and "ㅣ". Then, in stage 2 (which doesn't exist in English) you need to combine these into syllable blocks ("오" and "리"). Once you can read these syllable combinations, reading the word "오리" will be second nature to you. This happens in Step 3, which is basically identical to English's Step 2. If you understand the three stages of reading Korean that I just outlined above, then you have a simple-but-effective roadmap to improving your Korean ability. Can read Korean sentences quickly? Work on reading individual words. Can't read Korean words easily? Practice reading syllable blocks. Can't read syllable blocks smoothly? Review the individual hangul vowel and consonant letters. The problem with this roadmap, however, is that it doesn't provide an interesting and engaging way to get better at reading; it just recommends that you get better at reading by doing more reading. If you're struggling to read Korean already, that's not going to get you out of bed in the morning. If you really want to learn to read Korean more quickly, you're going to need a challenge. You'll need something that stimulates and motivates you to read the symbols, syllable blocks, and words of Korean as fast as you can. To improve your Korean reading speed, you'll need to learn how to type! Simple! If you know how to type something, you know how to read it. And vice versa. On top of that, typing is all about speed. If you can type fast, you can read fast, too. And there are many tools available to help you type fast, even in Korean! Let me show you how you can use typing tutors and games to improve your reading ability at each of the three aforementioned stages. The fundamental units of Korean writing are the letters, called "자모". Modern Korean has 40 of these, divided between 19 consonants and 21 vowels. Typing Korean letters is very similar to typing English letters; in most cases, each letter has its own key. The only exceptions to this are the double consonants (ㅃ, ㅉ, ㄸ, ㄲ, ㅆ) and certain diphthongs (ㅑ, ㅒ, ㅖ), which are accessible via the shift key on your keyboard. To practice typing individual Korean letters, I suggest that you use Hangul Attack, which is a freely-available Korean typing game for Windows, Mac, and Linux operating systems. 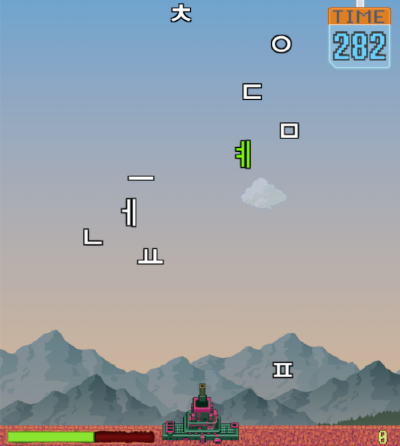 In the game, you are tasked with defending the earth from "Hangul aliens", that is, the Korean words and characters that fall from the top of your screen. Your goal is to stay alive as long as possible by typing (and therefore eliminating) each character before it reaches the Earth's surface. An example session of Hangul Attack’s “All Letters” typing challenge. Each of these modes tests your ability to read and type certain portions of the alphabet. By progressing from Vowels Only, to Consonants Only, to All Letters, and then to the endless Master Mode, you will be able to perfect your ability to recognize each letter, and quickly, at that. Once your skills are sharp enough to distinguish an "ㅏ" from an "ㅓ" at a moments notice, you'll be ready to face your next challenge: syllable blocks. Syllable blocks are more difficult to tell apart than individual letters. This is due to the fact that the blocks are more complex ("ㅓ" vs. "없") but also because the letter forms can become squished or elongated within each block (for example, "ㄱ" and "갑" both begin with the same character ). Furthermore, since syllable blocks are combinations of the 40 letters you have already learned, the number of potential syllable blocks is potentially huge. (I say potentially because not all possible syllable blocks are actually used in modern Korean). Hangul Attack, the typing tutor we used in the last step, does not have a mode for syllable blocks. So, to get around this, we'll have to use another resource. I recommend using a website called 10FastFingers, which offers typing speed tests in over fifty languages, including Korean. For this step specifically, you're going to need to create a (free) account, and go to the option in the sidebar called "Text Practice". This is where you can create your own texts to practice typing. Once you're there, click on "Create Text"
Next, you'll have to open a new tab and visit this link, which is a list of every single Hangul syllable block available to modern computers, sorted by starting character. From here, I recommend that you pick a group of syllable blocks that you want to practice (e.g. everything starting with a "ㄷ") and copy and paste it into the text you made on 10FastFingers. Once you save the file, you'll be able to practice typing all of the syllable blocks you pasted into the document, along with a session timer and error highlighting, both of which you can use to help improve your typing speed and accuracy. Do this for each of the consonants until you feel confident reading and typing most syllable blocks quickly. Don't worry about getting them all. Just focus on getting comfortable. You've conquered the 40 hangul letters. You've mastered the syllable blocks. All that's left now is the final stage: full words! This is perhaps the easiest stage of the three, as you can now practice reading and typing anything you see. Type any vocabulary or sentence lists into a digital flashcard system like Anki or Memrise. If you still need a little push before you start those kinds of activities, try taking another look at Hangul Attack and 10FastFingers, both of which have more tools that can help you improve your reading and typing speed for full words. Hangul Attack, in particular, has a "Words" mode that challenges you to type as many full words as you can before your in-game life bar runs out. 10FastFingers, on the other hand, has a standard Typing Test Mode, which will give you a random sample of the 200 most common words in Korean and ask you to type as many as you can within sixty seconds. These typing tools ask you to practice reading and typing some of the most frequently-used Korean words, so the skills you gain will help tremendously in day-to-day reading. Additionally, both Hangul Attack and 10FastFingers grade your performance (with a High Score and a Words-Per-Minute score, respectively), so you will always find a reason to keep improving your skills. Learning to type is a great way to boost your Korean reading speed in a way that is fun, challenging, and extremely motivating. Typing in itself requires all the basic skills of reading; you must know the letters and know how to put them together to form words. To train yourself to type well, you must also be able to read well, as most typing tutors will challenge you to quickly retype words and phrases that appear on a screen. It's impossible to accurately retype something that you're unable to read, so fast recognition of symbols and words is essential. No matter where you currently are in your Korean learning journey, take the time to learn to type as soon as you can. As your typing skills improve, your reading skills will improve, and with better reading skills, you'll be able to acquire Korean much more quickly and efficiently.